The company added that as Jio’s base of over 186 million subscribers and another 150 million smartphone users was ready, JioInteract was to become the largest platform for movie-promotion and brand engagement. “Over the next few weeks, Jio will introduce services such as video call centres, video catalogue, and virtual showrooms to the forefront redefining customer experience,” said the statement. Have a question for @SrBachchan ? Then get it answered by the Shehenshah of Bollywood himself on #JioInteract – world’s first AI based live video call! 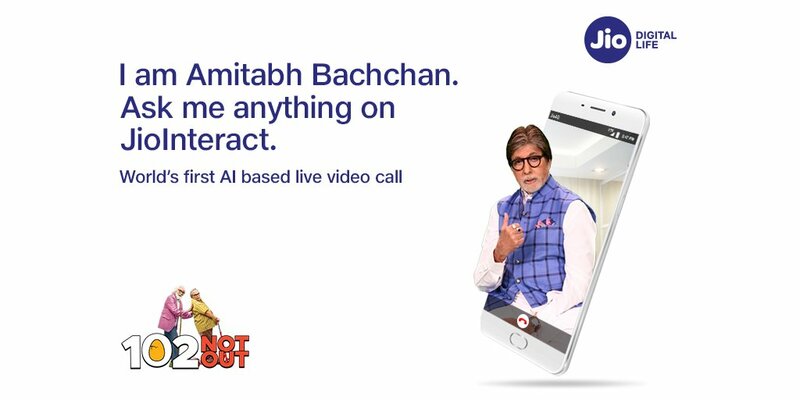 JioInteract’s first service Live Video Call will allow all Jio and other smartphone subscribers to make a video call to Bachchan anytime during the day, starting 4 May 2018. Users can even ask questions related to his upcoming film, 102 Not Out and book their movie tickets in real-time through JioInteract’s ticketing partner BookMyShow. “This unique and innovative service uses a powerful artificial intelligence based platform to listen to user questions and respond to them in the most appropriate way. In addition, the platform has a unique auto-learning feature that helps improve the answering accuracy,” RIL said in a statement.